Not the Heinz 57 variety, but a good old fashioned bring you up to speed "catch up." Rather than continue the slog to provide content for two blogs and two websites, I have decided to consolidate. I was paying for more cyber real estate than I was really using anyway. So welcome to BubbaThePirate.com! This is where you will find my boat related blog posts. My non-boat writing blog is found here. In case you have just arrived, this will catch you up. In April 2007, I quit a nine year office job and bought an old sailboat. Not a romantic OLD wooden ship, but a fiberglass sloop just old enough, and just neglected enough, to be in my price range. She is a 28 foot Cape Dory; a wonderful little ship that I found in Bay City, Mi. There was, however, a lot of work to be done; more than I thought. 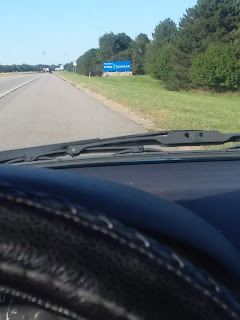 When I cashed in and checked out in Indiana, I felt like I was loaded. Comparatively so, I was more loaded than I had ever been, but that really wasn't saying much. I was quickly caught in the tarpit of "Bigger Project and Less Budget." I was two steps past broke when I left Bay City and hit the road as a long haul truck driver. In the beginning, home time was rare, but I worked on the boat when I could. As I moved up the ladder at various trucking companies, I was able to spend a little more time with my baby. In 2009, I moved the boat to a marina on the westside of Michigan. Now that she was only about 30 minutes away, I got a lot more done that summer. This last Summer, I worked part time for four months and got even more done! 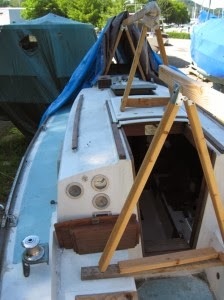 Of course, working part time while refitting an old sailboat is a perfect way to go broke. So last Fall, I went back to driving full time and delivered office furniture all over the Eastern United States. It was a good little company, and a good job, but I was not able to dedicate much time to my writing. Also, I was dead sick of Winter Driving. Life is too short not to like what you're doing. So, I'm entered a new phase in January. I quit my commercial driving career to enter a job training program. The program was subsequently delayed, and delayed again, so I looked at other options. I am now about halfway through a course that will lead to a national certification as a Pharmacy Technician. The cert should travel well once I'm sailing. For now, I'm working part time, going to school and working on the boat. My recent boatwork was in planning out what all needs to be done before she is launched again. It appears that I have more manhours, and more money, to spend than will be available this Summer. Hopefully, next summer she'll be in the water. She'll let me know when she's ready.